If you asked me what my biggest gripe with RuneScape has been over the past four years, it’s the aura system. 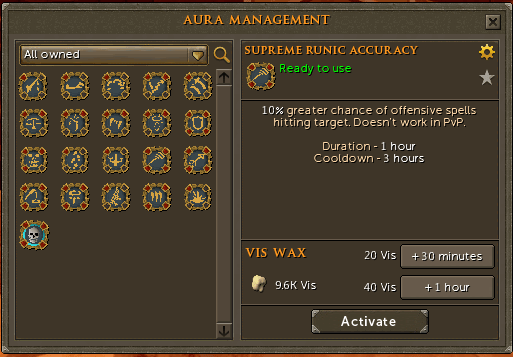 Auras are RuneScape’s temporary boons, they give bonuses to various parts of gameplay, and by golly are they a pain in the rear to keep track of. There are several dozen of them, and when they’re all given crazy names like “jack of all trades” or “Supremic Runic Accuracy,” managing a bank full of them, figuring out which you need to upgrade using loyalty points, and the best points to take them out is a nightmare. Cue this week’s update, removing all of the auras from the bank and placing them in an easy to use, simple to manage interface. This system is about as close to perfect as you’re going to get, especially considering it can be accessed during combat and the interface allows you to easily extend and renew auras with vis wax. Functionally it lets people like me remember which auras we have, and keeps us engaged via a daily regimen of in-game tasks.